Garages and storage sheds are great solutions to a lot of problems for many Perth residents and for far less money than a bricks and mortar construction. Recently, Chris in Kalamunda needed both a workshop and a garage. When many people hear the word “shed,” they think of a flimsy shed from one of the “big box” stores, which comes in a kit with little support and less customisation options. At Action Sheds Australia, we only carry ShedSafe certified sheds. This means that every shed is going to be appropriate for how you are going to use it and where it is going to be erected. Chris chose a combination garage and workshop-storage shed from COLORBOND. COLORBOND makes their own steel to rigorous standards and then adds an oven-baked finish to the parts. This keeps the surface from blistering or flaking, while the ZINCALUME steel base is corrosion-resistant to help produce long life. COLORBOND sheds are available in 20 different colours. Usually, this means that you can easily find something that looks great alongside your house and will match the COLORBOND fence, steel roof, downpipes and gutters. 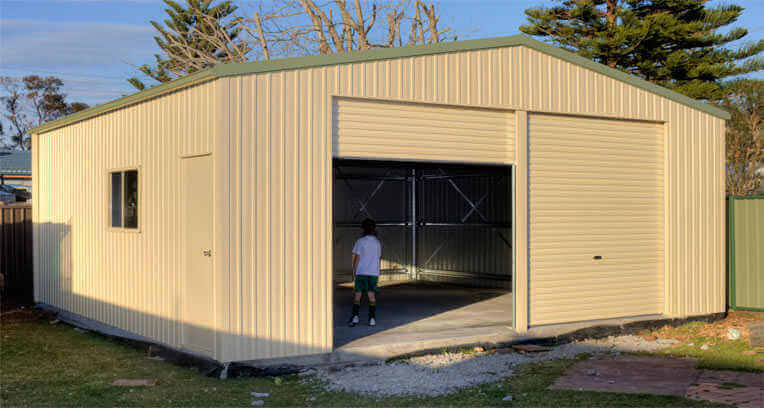 COLORBOND sheds are available in many different shapes and sizes as standard sets and we will be happy to customise any of our sheds to fit your individual situation. The COLORBOND dual-purpose garage and workshop that can also be used as a storage shed was a perfect solution for Chris, who can now use it as both a garage and workshop and still have room for storage. Chris was very happy with both the service and the results. Chris went on to “personally recommend this company to any prospective client.” We would like to thank Chris for his great feedback. Call 1300 778 628 for more information.